I have a 60l tank that is populated with cherry shrimp only. I'd like to add a fish or two, if there is anything suitable. I've used it for quarantine many times. It's been set up for several years. The tank is heavily planted with crypts. See pic at the bottom. The problem is it is heavy on flow. It has a 1000L/H filter hooked to it which is about 30X the volume of water an hour. The tank grows very nice green algae on the glass, not on the plants. The substrate is sand. There isn't much open area for swimmers. They fish would have to weave through plants. Plus the flow is heavy for most small fish I can think of. The temperature is kept tropical, around 25C but I can alter that down if needs be. The shrimp will be perfectly fine. I do not want to bring it up, too small water volume to be kept warm. I do large water changes weekly on it normally. It is otherwise low tech, nothing added bar dechlorinator. Oh, and I forgot to say...the water is hard, ph about 7.4, TDS about 275ppm. Any ideas? I don't want many fish, a pair would do...just something to keep me interested. Here is a glimpse at it below as it is currently now. See the tick green algae at the back. It grows the same all over but for the picture I scraped the front glass. The shrimp and snails love it. 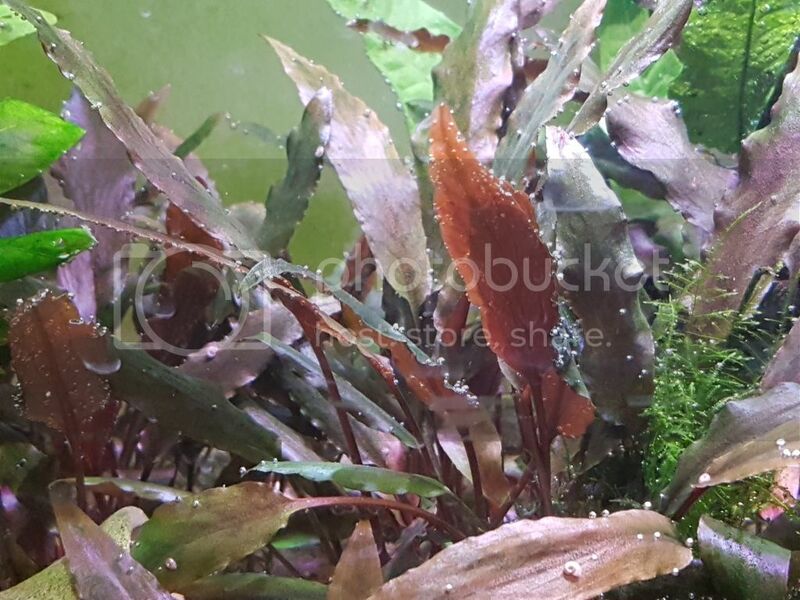 While I wonder why one would have a flow of 1000 l/hr for shrimps, the pictures of the plants show thy grow nicely. Not hapered by the current at all. That is not much - if you compare it with a river. Thanks for replying Bas Pels. The reason for the filter is because I had it laying around. The flow is actually ok-ish considering. It won't blow fish. Its just that some fish don't like that much flow. ...I am not just into loaches. I myself can't think of a type of fish right now but I know I want something. I can clear a bit of the plants and have a sandy area. I actually had 6 kuhli loaches in there before. They really liked the cover. I moved them to my indoor pond with the clown loaches end of last year sometime. They are several years old now. I hope they didn't mind I feel like something I haven't had before, that's all, if there's anything that could suit this tank. The barbs are nice, I've seen them here locally and they look great in people's tanks but I am after something like a pair maybe, that can breed perhaps. I am not sure what, hence asking. For non-loaches, fish ID and information, I like this site. Here is a link to one of the dwarf Rasboras that could work in your set up. A pair, that breeds. Perhaps you are thinking of a cichlid species. Dwarf cichlids, such as Apistogramma, Mikrogeophagus, Nannacara do not dig, but only Mikogeophagus pair up. The other species are more harem like, but a 60 liter tank is too small for 2 females. I think the rasboras are not the type of fish I am after. I feel bad rejecting suggestions. I seem hard to please. But I had quarantined halrequin rasboras recently in the tank and they just avoided the current on the opposite side.Having said that, they did play in the current from time to time and do the same in the pond they are in now. They go straight to the outflow of the filters and just swim against....so maybe I am wrong. My water is too hard for them to breed but two already paired up so it seems they too prefer the pond(flow is about 8.5 x) So I feel that another rasbora from sluggish water won't do that well in flow like that. Plus fish that don't like exploring the bottom, won't have much space above the plants to swim freely because the plants occupy half way the height of the tank. These crypts are very old and have grown massive. 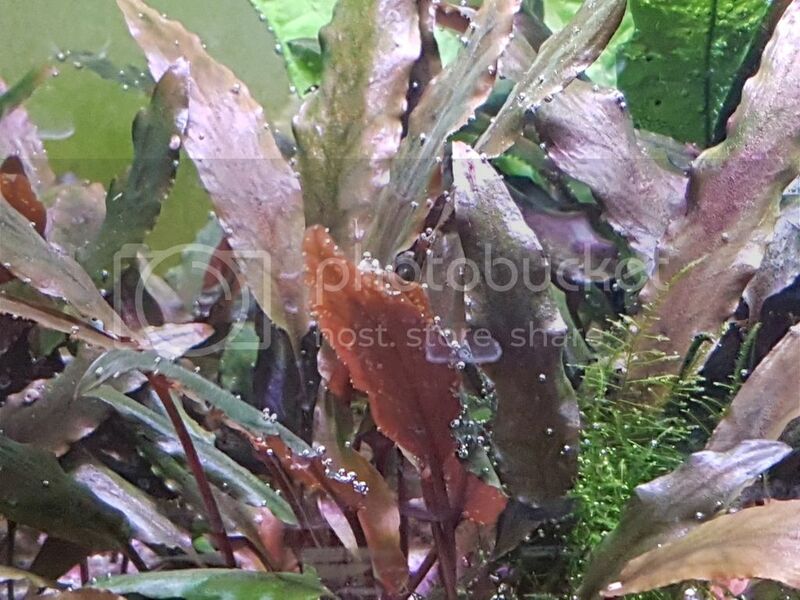 But the kuhli loaches before hand and the two clown loaches I had quarantined in there seemed very happy hiding in the plants and just generally browsing. I could see the kuhli loaches all the time when they were in there, lights on non-stop. In the big tank they're now mostly nocturnal. So maybe shy fish that like lots of cover will do well. As for cichlids, my water has always been too hard for them I feel. I just came across panda garra. See a video of them below. What do you think? They may like the flow, the algae on the glass, etc...I am not sure they'll like the plants but as I said I can clear one side of the tank a bit and put a few rocks instead. I loved my panda garras! Or maybe otocinclus? They're not usually considered a hardwater compatable fish but they are more adaptable than you might think. There's always a BN plecos. Thanks Nancy. I should look around for the panda garras then. They seem like something I want to try. I've had otocinclus. As a matter of fact they do very well in my water and even bred once. I raised the fry in that same little tank. I also have a bristlenose pleco, about 4.5 years old now. He's in the pond. I think he's a bit too big for that tank although as a lone fish he he might have done ok. I actually have had the exact same fish for many years, which is corydoras, platies, plecos,otocinclus, kuhli loaches and clown loaches, also shrimp. Within the last year I felt like change so now I also have denison barbs, SAEs, harlequin rasboras, and I just want something new for the little tank too. At some stage I had guppies and dwarf rainbows but they aren't very long lived, lasted 3-4 years max and I prefer longer lived fish which is why all those choices were made. Hopefully they all live long and happy lives as planned. This tank would be ideal for hillstream loaches. They like big water flow and algae. But just pair wouldn't be good. 6 fish or more is ideal. Water temperature is fluctuating between 20 and 25°C, TDS 150-200ppm and pH around 7,5. I had them for 3 month without problem in tank: 80x25x30cm, filtration 750l/h powerhead. Now I moved them in bigger tank, but with same water parameters. Thanks nhkg. I will have a look. Hillstream loaches are easily available here. I just need to research the species. Its definately an option I'd consider. I am thinking of going to the shop tomorrow. I am pretty certain they had hillstream loaches last time I checked. I turned down the heater. I'll have to see how down as it is it doesn't have numbers on the dial but I am guessing anything between 20-23C. I moved the spraybar too so water flows along the length of the tank which will provide unidirectional flow. It creates quite the surface movement too. I can also add some smooth stones on one side for algae growth but the glass normally naturally goes green. The problem with my local fish shop is that one doesn't know what species of loaches they carry..? I'll just have to get what they have without knowing and identify later, unless I change my mind in the last moment of course, and not get anything I just need to be careful not to get species that require acidic waters or that grow too big. I'll be googling on the spot Are these fish jumpers? My cover is not firmly attached at all and I'd also rather have it off altogether as I can't firmly close it because of the type of light I use. Hillstream loaches are not jumpers, but they can climb on glass even above water level. Last edited by nhkg on Sun Apr 16, 2017 1:55 am, edited 1 time in total. Oh, wow, that one just climbed out of the tank, lol. I will google the species in the shop once I see how exactly they look like. I don't buy fish without knowing them but I don't know all the different hillstream varieties. They may or may not know the exact species they carry but they normally know the import location. The last time they only had a couple of hillstream loaches in separate tanks so they may not even have any of them. Either way, it will be nothing fancy and probably a very common species. No rush anyway, I am not 100% yet sure. I'll have to see them first. I forgot today was Sunday and a bank holiday Easter....so no fish yet. I maybe going this week or latest next to the capital and visit a very large fish shop. I'll see then. I've been browsing and re-searching and apart from the butterfly loaches and panda garra/garra flavatra, I can't like any other fish fpr this tank but the latter is hard to get. So hillstream loaches it will be...if they're are in stock...which they don't seem to be but maybe its not advertised online as it happens.